Other sizes available: If you dont see whta you want please contact us. 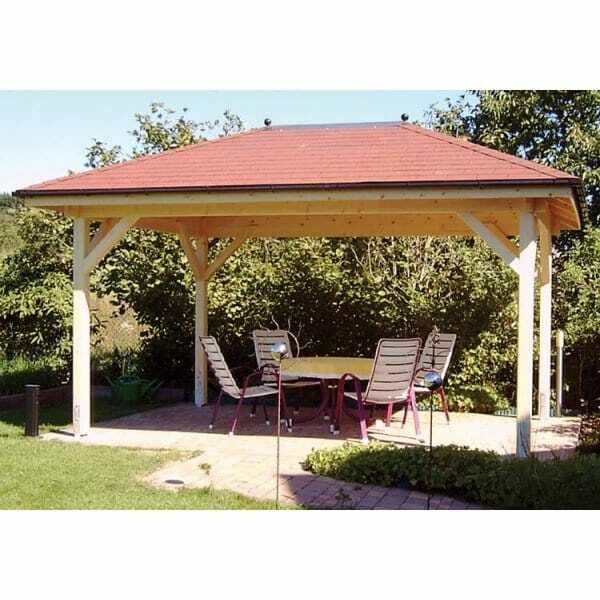 Bertsch Helena Open Sided Gazebo Pavilion: The Bertsch Helena Open sided pavilion / gazebo is an extremely well made gazebo kit featuring glue-lam posts of 120mm x 120mm Square. Designed to produce an attractive Garden Feature the Helena provides a perfect sheltered spot in the garden ideal for the garden furniture when enjoying a barbeque evening or simply to enjoy time in the garden with family and friends. As there are 19 size options there is a size to suit most purposes. For added stability - any side of 5m or more will have a post in the centre - so for example a Helena of 4.5m x 4.5m will have 4 posts but one of 4.5m x 5m will have 6 posts - i.e. a post in the centre of both 5m walls. We are pleased to offer optional Adjustable Galvanised Feet with the Bertsch Helena. These are designed to be used on a hard surface - concrete or similar and will keep the end of the wooden posts well clear of any mud etc and therefore will help to extend the life of the gazebo. Please note: Both Copper Cap and finials and Metal Feet shown in main images are options and not included unless chosen. For Copper Cap Pricing - Please contact us.